I’ll quickly preface all of this with: I refer to Monzo as a bank, which is true… Mostly. You can’t use them to pay for Direct Debits, Standing orders or a handful of other things. 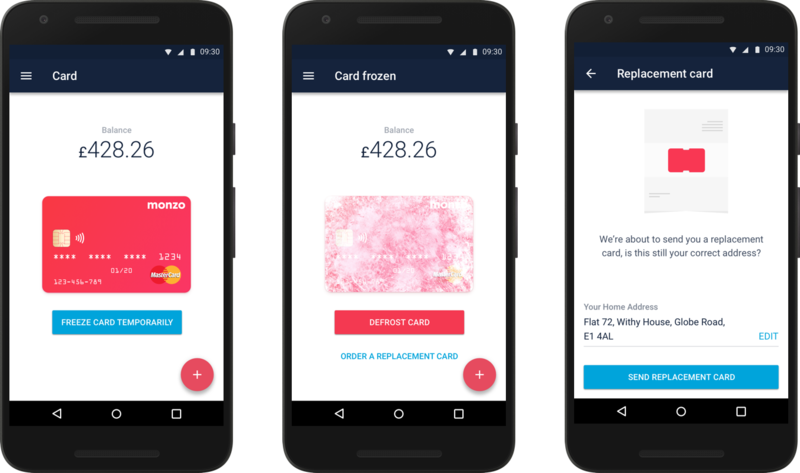 In their current state, Monzo is using prepaid Master Card cards. Which are pretty similar to normal debit cards, key differences being; they’re useless for ‘Pay@Pump’, payments will fail from time to time (Monzo is still in beta after all 😉 ) – Q1 / Q2 2017 will bring about everything you’d expect from a bank though! So there’s not too long to wait. There will be sort codes, account numbers, direct debits, standing orders, you’ll be able to get your wages paid directly into your account, have your phone bill come out, have a full debit card, etc. Currently Monzo isn’t perfect, the Android app isn’t quite on par with the iOS counterpart but that’s fine and there’s a dedicated team of Android engineers working nonstop to get the app feature-par with the iOS version. So this bank likely isn’t for you just yet. But if you’re willing to give it a go, be brave and give it a chance? Well – You get a stunning app on both iOS or Android, a truly eye-catching bright coral card, perfect 24/7 tech support, from a real person with a real sense of humour and you’ll be part of a community of people all dedicated to making a modern bank! Sadly no, not yet anyway. For security’s sake, I’ll say I use 2 banks + Monzo. My banks are old, traditional and well… boring. They work but their breakdowns aren’t great, I plan all of my months out by myself with a calculator to see what goes out and how much will be left after this that or the other, etc. And despite that being an incredibly simple 5 minute task, it’ll only get longer and more complicated with time! Think about all those bills, shops, lunches and dinners you pay for? Not to mention all of the clothes you buy and the amount of Amazon baskets you fill up! It all starts adding up quite quickly and if you’ve ever tried to read through a traditional bank statement… well I’m sure you’d still be on last months while the next month’s arrives 😉 Monzo does this all with ease. There's a lot of iOS specific features. I'll be focusing on what I know, Android! A very recent feature, so recent in fact that it’s only in the Beta channel of the Monzo Android app! #Spending – At a glance, it’s clear where my £££ has gone, I can see how much I’ve spent all month, spent eating out or shopping or buying groceries – I can even further break it down – How much I’ve spent at each merchant for the ‘Eating Out’ category, it’ll be easy to see how much you really do prefer KFC over Burger King 😉 – Yet further still, we can break it down – Monthly spends at Morrisons (for example) then listing each spend at Morrisons, then even better, I can click any Morrisons transaction, see number of transactions, average spend and total spend, all in what took 3 seconds and a couple of clicks – Incredible! Uh oh! That horrific moment when you open your wallet and notice that your shockingly bright Monzo card isn’t there?! Well, fear not! Head into your Monzo app and simply freeze the card, no need to wait on hold for a ‘UK’ based bank agent… No need to waste 10 minutes on hold while you spend 20p a minute to a damn bank line! All of that is avoided with Monzo, there’s a button, tap that and your card will instantly freeze, no transactions will be possible once you’ve done that. Better yet?? You get active notifications of when and where (with a handy-dandy Google Maps link) that attempted transaction took place. You can either head there, call the police, look for your card – or just order a new one, with next day delivery if ordered before 3pm 🙂 No robot call ‘assistants’ to cope with, you don’t need to remember which scarf your Mum’s brother’s son’s brothers best friend’s dog was wearing in the summer 4.278 years ago, just a button! That little graph at the top? Well that’ll let you super easily view how quickly you spend (via the steepness of the graph) when large payments come out, if you need to top up you’ll see the graph raise slightly, etc. It’s a super nice feature, both in terms of looks and functionality! Well, like I said earlier, a bank that’s not quite a bank yet. So until full current accounts can be implemented we need to top up! Sound a bit weird for a bank, granted. But it’s so straightforward it takes no effort whatsoever. This is where Android is even faster than iOS 😉 Just hit the FAB (Floating Action Button) in the bottom right, you’ll be asked for an amount, keep hitting the + until you get to the amount you desire, hit the big top up button and you’ll have ‘x’ funds instantaneously appear in you Monzo account! This functionality will disappear once we have sort codes, account numbers, etc. This is where things get interesting again. Petrol for your car? No problem, that can go under the ‘Transport’ category, oil for your van? Tyres for your flatbed? All of these can go under the transport category and you can see how much is spent on a category-by-category basis, for each month! All of your expenses can add up in a month, it’s great that they can be added to one simple place! Better yet? Notes and receipts can be attached to individual transactions. All of these things help you plan, spot trends, spend less, save money and in general allow you to organise your money the way it deserves to be organised! I think I’m going to leave it at that, with more Monzo updates to be coming in the future! This is my bank, I will be happily walking away from 2 other banks in favour of Monzo, for all of its (what? 2?) flaws, its Beta status and it’s newness, I still love it! And so do hundreds of thousands of other people, not to mention the investors who raised £1mil in … 96 seconds! !